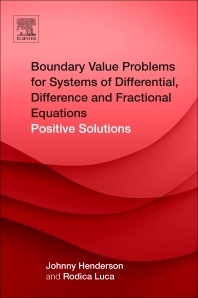 Boundary Value Problems for Systems of Differential, Difference and Fractional Equations: Positive Solutions discusses the concept of a differential equation that brings together a set of additional constraints called the boundary conditions. As boundary value problems arise in several branches of math given the fact that any physical differential equation will have them, this book will provide a timely presentation on the topic. Problems involving the wave equation, such as the determination of normal modes, are often stated as boundary value problems.